This entry was posted in property coverage public adjuster public adjusters on February 25, 2018 by AAAPUBADJ. Business Interruption Insurance is in most business insurance policies. It covers lost income when a business owner has to close his or her business because of a covered cause of loss. It’s a layer of protection that all business owners should have. For example, if your business closes because of fire and smoke, the property insurance portion of your policy will cover the damages to your building and contents, but it will not cover lost income. Business Interruption Insurance, also known as Business Income and Extra Expense Insurance, will cover that lost income to your business. The profits you would have earned if the loss did not occur. Normal operating expenses of the business while the business is closed. This will include your employees’ wages so you can keep them on staff during the business interruption. The cost of moving your business to a temporary location. This includes both the moving and rent costs. The payout amounts will be based on your business records. Therefore, it is advisable to store these records on servers or computers off-site. Insurance carriers have clear language in their policies concerning what will trigger Business Interruption coverage. In general, coverage starts right after the loss, except in the case of civil authority closure where it starts 72 hours after the loss, and lasts until your business location is up and running again. Additionally, some policies also include extended business interruption coverage, which provides coverage for additional losses that may occur after the property damage is fixed while the business is still regaining its previous customers. Business Interruption Insurance is typically part of a Business Owner’s Policy, also known as a BOP within the insurance industry, which is a package policy for businesses that includes Business Interruption coverage, General Liability coverage, and Property Damage coverage. Since the BOP is a comprehensive insurance policy, it is highly recommended for businesses to purchase this policy. Contingent business interruption, (CBI) covers an insured’s business income loss resulting from loss, damage, or destruction of property owned by others, which would include direct “suppliers” of service or goods to the insured and/or direct “receivers” of services or goods manufactured or provided by the insured. The property damage to these suppliers or receivers must be of a cause of loss that would be covered under an insured’s policy had the damage occurred to the insured’s property. Service interruption provides coverage to a business owner for direct physical loss, damage, or destruction that occurs at the following type of utility companies: gas; water; sewer; and/or electric that would cause the business owner to shut down his or her business. Coverage would also be extended if direct physical loss, damage, or destruction would occur at related plants, substations, and equipment suppliers that service those utility suppliers and cause the above-referenced utility suppliers to shut down and, thus, cause the business owner to shut down. 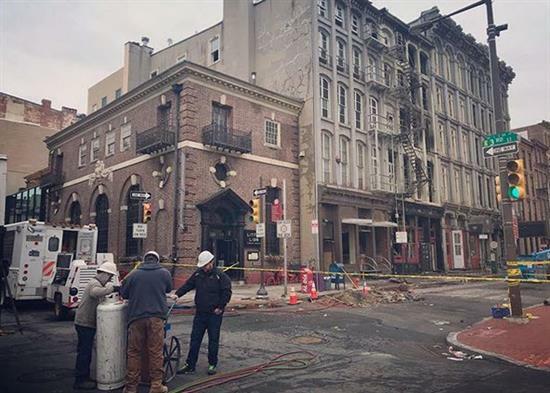 With the recent business losses due to a fire at 2nd and Chestnut Streets in Philadelphia, it is recommended that these business owners contact AAA Public Adjusters for a free consultation. With our help, the business owner will have a proper settlement to their claim. AAA Public Adjusters now services 10 states that include our newly opened offices in Virginia and North Carolina. We have over 25 years experience in serving homeowners and business owners as property loss consultants in the preparation and filing of their property insurance claims. Don’t hesitate to call us anytime of the day or night! ← What Are the Best Water Damage Claim Filing Tips? This website is not endorsed or approved by, and is not in any way affiliated with the American Automobile Association, Inc. (‘AAA”). AAA makes no representation about the products and services advertised and offered on this website.